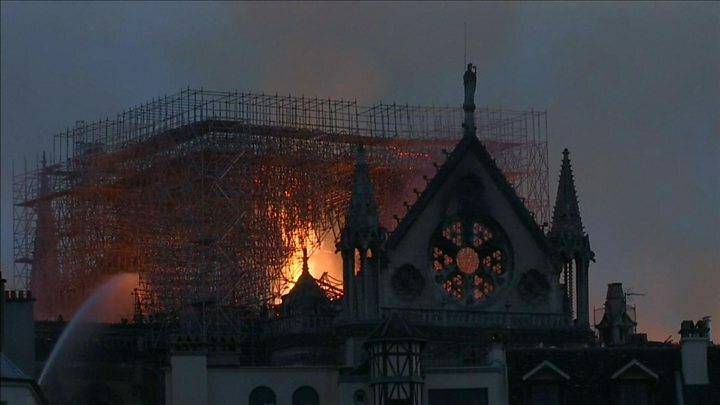 French President Emmanuel Macron don promise to rebuild di 850 year old Notre-Dame Cathedral afta big fire burn some part of di popular building for Paris. French fire brigade for Paris don quinch di fire and dem say di main stone building including di two towers dey safe. Dem say di fire dey under control almost nine hours afta e start. Di cause neva dey clear but ogas say e fit dey connected to di large renovation works wey bin dey go on. Paris Law office say dem dey investigate di mata as accident. One firefighter sustain serious injury while dem dey Attack di fire. As e ddey visit di place wia e happun on Monday night, Oga Macron say"dem don avoid di worst" as e be say dem save di cathedral main building, na dia im promise to launch an international fundraising scheme for dem to rebuild am. 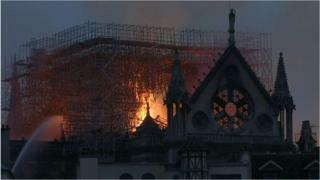 Di fire start at around 18:30 (16:30 GMT) on Monday and quickly reached di roof of di cathedral, destroying di stained-glass windows and di wooden interior before e scata di spire. Firefighters then spend hours dey work to prevent one of important bell towers from falling down, Search teams dey now look di kain damage wey happun for di building.